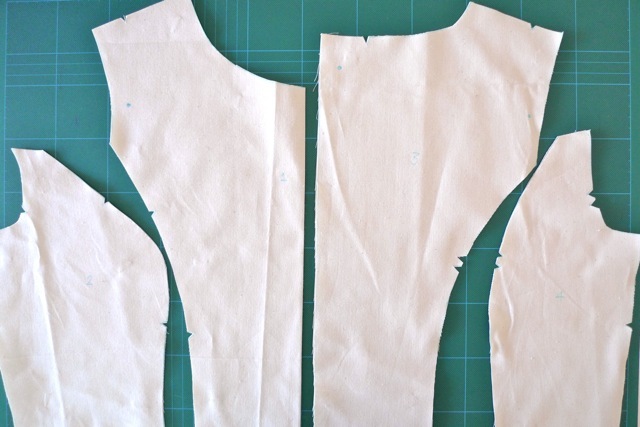 When you cut out a pattern, how do you decide which size to go for? We all come in different shapes and sizes (is that a line from a Paul McCartney song or I have I made that up?) so it's unlikely you'll exactly match one standard pattern size. Moreover, most commercial pattern sizes come up large so their sizing chart can be misleading. In the past I've operated a trial and error policy, but for my Joan Holloway dress (aka V8413 - yes! I'm finally making it!) I thought I'd try a more systematic approach - measuring the pattern pieces and comparing them to my body measurements. I'm documenting it here to remind myself what I did, but hopefully you may find it useful too! I start by taking my measurements - bust, waist, hips and back length. I tend to do this after lunch and practise Pranayama breathing to ensure I'm not going to suffocate in my finished garment! If I believed the size chart on the back of the pattern, I'd think I was somewhere between a size 10 and 14. But I know that most commercial patterns come up large (just look at the frumpy illustrations! ), so I start lower, with a size 8. If, like me, different parts of your body fall into different size columns, it's advisable to pick the right bust size as the other bits are easier to adjust. - Front bodice piece (cut 1): 20.25" minus 2 x 5/8" seams = 19"
- Back bodice piece (cut 2): (10" minus 5/8" seam minus 5/8" zipper seam = 8.75") x 2 pieces = 17.5"
- Front bodice piece (cut 1): 14.25" minus 2 x 5/8" seams = 13"
- Back bodice piece (cut 2): (8.5" minus 5/8" seam minus 5/8" zipper seam minus 1" dart = 6.25") x 2 = 12.5"
- Skirt front (cut 1 on fold): (10.5" x 2) minus 2 x 5/8" seam allowances minus 2 x 1" pleats= 17.75"
- Skirt back (cut 2): (10.5" minus 2 x 5/8" seam allowances = 9.25") x 2 = 18.5"
Pattern size chart: 31.5" / 24" / 33.5"
Pattern piece measurements: 36.5" / 25.5" / 36.25"
My measurements: 33" / 26.5" / 37.25"
Now, I'm making my dress in a double knit jersey - for stretchy fabrics you don't need to add ease so I'm going to choose a close fitting size. If you're using a woven fabric, you'll want to add a little ease - it's up to you how close fitting you want it to be, and will depend on the type of garment you're making (ooh la la cocktail dress or a skirt you want to be able to run for the bus in?). You can add an inch or two here and there to accommodate breathing, sitting down etc. Notice there is a 5" difference between the bust size on the chart and the pattern pieces. The pattern I'm using has a cowl neckline so the bust line will be loose fitting. 3.5" of cowl-ness sounds about right, so I'm going to go with a size 8 bust - and if it turns out to be too big, I can always take in the side seams later. My waist and hips are 1" bigger than the pattern, so I'm going to cut these parts of the pattern one size larger. I mark a diagonal line in red from the size 8 bust line to the size 10 waist line - this will be my new cutting line for the bodice pieces. For the skirt pieces, I'll just cut out a size 10. The bottom of the pattern indicates that the back length of the size 8, from the nape of your neck to the hem line, is 38.75" (watch out though, because back length can also mean nape to waist). As I'm little, I want mine to be 38", so I need to shorten the length by 3/4". I know that I have a smaller than average torso, so I'm going to shorten the length of the bodice. There is a line on the front and back bodice pieces which says "lengthen or shorten here". I fold over and tape the pattern paper to get rid of the excess length. Next I'll smooth out this disjointed line to create the new cutting line. Now I'm ready to cut out my fabric. I often make a muslin version in Swedish tracing paper, but as I'm using double knit, which drapes in its own peculiar way, I'll just pin or baste the pieces together to check the fitting before stitching. I hope that made sense... and I hope my calculations were correct! If in doubt, cut large. But if you can cut out the right size from the start, it's going to make your life a lot easier!